Objectives Pharmacogenomics (PGx) is often considered a low-hanging fruit for genomics–electronic health record (EHR) integrations, and many have expressed the notion that drug–gene interaction checking might one day become as much a commodity in EHRs as drug–drug and drug–allergy checking. In addition, the U.S. Office of the National Coordinator has recognized the trend toward storing complete sequencing data outside the EHR in a Genomic Archiving and Communication System (GACS) and has emphasized the need for “pilots that test Fast Healthcare Interoperability Resources (FHIR) Genomics for GACS integration with EHRs.” We sought to develop a PGx clinical decision support (CDS) service, leveraging the emerging FHIR and CDS Hooks standards, and based on an assumption that pharmacogene sequencing data would be stored alongside the EHR in a GACS. Methods We developed a PGx CDS service as a functional prototype. The service is triggered by a medication order in the EHR. When evoked, the service looks for relevant genetic data in a GACS and returns corresponding recommendations back to the ordering clinician. Where the patient has no genetic data on file, the service can recommend pretreatment genetic testing where applicable. Results Overall, we were able to meet our objectives and deploy a functional prototype, interfaced with a commercial EHR. We identified several areas where FHIR or CDS Hooks lacked necessary semantics or have implementation ambiguity. Primary FHIR challenges included multiple ways to say the same thing, which exacerbated the complexity of variant to allele conversion and lack of representation of deoxyribonucleic acid region(s) studied. 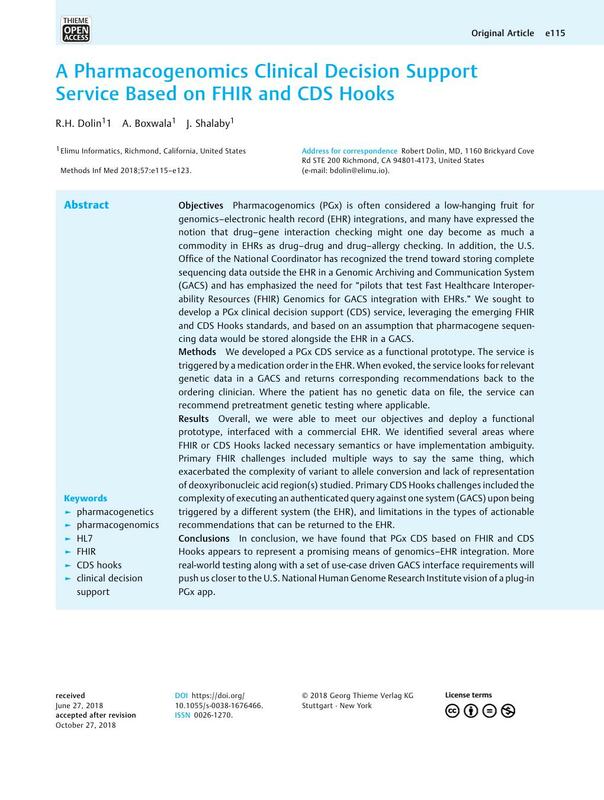 Primary CDS Hooks challenges included the complexity of executing an authenticated query against one system (GACS) upon being triggered by a different system (the EHR), and limitations in the types of actionable recommendations that can be returned to the EHR. Conclusions In conclusion, we have found that PGx CDS based on FHIR and CDS Hooks appears to represent a promising means of genomics–EHR integration. More real-world testing along with a set of use-case driven GACS interface requirements will push us closer to the U.S. National Human Genome Research Institute vision of a plug-in PGx app.